From left to right – Mark Dickinson, Interim CEO, State Senator Alan Hays, State Representative Marlene O’Toole, Richard Macheck, State Director of USDA Rural Development for Florida/U.S. Virgin Islands, Beverly Paulk, CHC Board Chair, Mayor Mike Radzik, City of Groveland, and Maria Rodriquez-Scott, CHC Board of Directors. 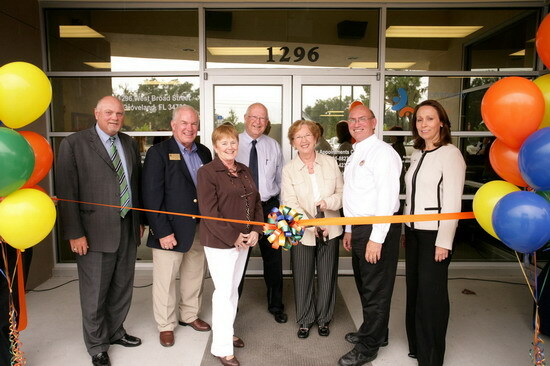 Community Health Centers, Inc. (CHC) celebrated the opening of the new Groveland Center Building with a Ribbon Cutting Ceremony on Monday, June 27, 2011. Through a partnership with the U.S. Department of Agriculture, Rural Development, CHC received a $1.5 million Rural Development Community Facilities Guaranteed Loan and a $500,000 Community Facilities Direct Loan to help build this $2.6 million dollar facility. The new health center has replaced the former Groveland Family Health Center, and is still located at 1296 West Broad Street, Groveland, FL 34736. Patient access to services was not compromised during the year long construction, as the existing Groveland Family Health Center continued to stay operational during the construction phase. The new building was completed and opened on April 12, 2011 for patients and the old building was demolished and a new larger parking lot has been built to handle the increased patient volume. CHC was able to expand the health center from a 9,450 square foot building into a 13,600 square foot new facility – expanding existing Family Practice care and Adult Dental care, and providing new Pediatric and Pediatric Dental care services. CHC has been providing medical, dental and pharmaceutical services to the Groveland community since 1978. In the past year, the Groveland Center provided medical services to 2,500 patients, with 8,505 visits and dental services to 1,087 patients, with 3,590 visits, and 20,213 prescriptions were filled within the pharmacy. The ribbon cutting ceremony gave members of the Groveland community an opportunity to tour the center and meet the staff serving the site. Special guests and speakers included Mayor Mike Radzik, City of Groveland; State Senator Alan Hays; State Representative Marlene O’Toole; Richard Machek, USDA Rural Development State Director; and Beverly Paulk, Board Chairperson, Community Health Centers, Inc.
Community Health Centers, Inc. is a private, nonprofit organization that provides primary and preventive medical, dental and pharmaceutical services to insured, uninsured, underinsured, and underserved children and adults within Central Florida. CHC has 11 clinics which are located in Apopka, Eatonville, Groveland, Lake Ellenor, Leesburg, Pine Hills, Winter Garden, and Zellwood. Last year 50,726 patients received care at CHC’s centers. CHC accepts Medicaid, Medicare and many private insurance plans, and a Sliding Fee Program is also available.